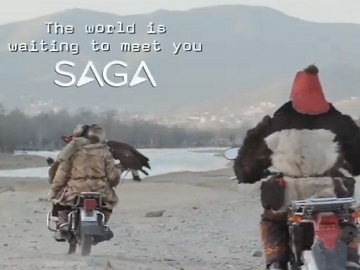 Saga Holidays advertise their worldwide tour in a new advert. The spot features a Mongolian dancing in front of some friends, in the snow, and telling them he got those moves from Charlotte. Describing her as “amazing,” he also recalls some of things she said and done and shares them with his fellows. “She said ‘I’ll dance until my shoes fall apart’. Then she kicked one in the fire. She said I should join her dance team back in Blackpool. I said ‘Would my eagle be welcome in the ballroom? '” As he reveals his reply to the other locals, they all burst into laughter. A final onscreen line informs that Charlotte danced through Mongolia on a worldwide tour and then the tagline “The world is waiting to meet you” flashes across the screen, as well. Saga have been creating holidays and cruises exclusively for over 50s for more than 60 years. With holidays designed to suit a variety of travel styles, Saga Holidays gives its customers the chance to enjoy memorable experiences, from alpine adventures in the Canadian Rockies to a relaxing Caribbean dream in the Bahamas. All their holidays are fully protected by ABTA and ATOL, every tour departure is 100% guaranteed, and many of the holidays include more service in the price, such as optional travel insurance on all overseas holidays, and a UK door-to-door car service.